Currently viewing the category: "Xmas Loot"
Christie’s folks brought this up with them when they came for Christmas, and if it were my only gift, I’d be ecstatic. 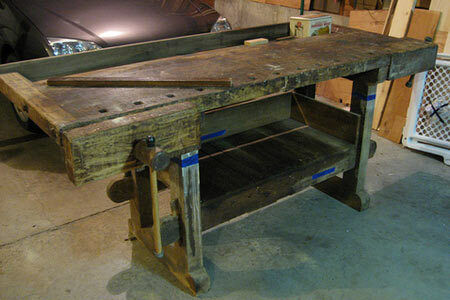 Here’s what we know about it: It belonged to her great grandfather, who was a hospital administrator in Michigan. The hospital he ran provided occupational therapy for shell-shocked vets returning from WWI, and it likely came from there. The blue tape is the labels Christie’s dad made so we could reassemble it. It will quite likely never be this clean again. We’re not sure it would be any more useful cleaned it but we’re positive it would lose some character if he polished the ol’ tank up. Besides, half the fun of having a rig like this is making a mess with it. Looks great to us just the way it is. X-Mas Loot: What Did You Get? What was normally a 30-minute drive took two hours on Christmas morning this year. We had awful weather here in north Texas. However, when the family finally did converge at Mom’s place I was greeted with a giant smile, a pile of homemade chocolate chip cookies, this little ornament for the tree, and the promise of more to come. I was home. It was a good year for the relatives to go tool-gift shopping because there’s so much great stuff to give your favorite Toolmonger. Did you get any cool, tool-related loot this year? Post it up to the photo pool — we’d love to see it! 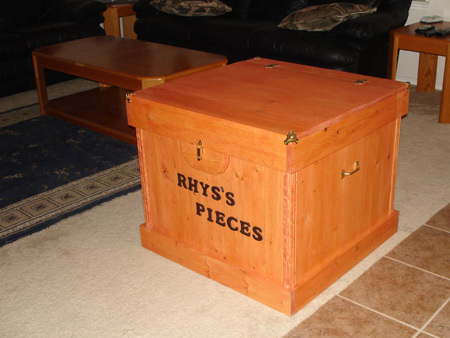 Before it makes its journey to my godson’s bedroom, I thought I’d take a quick picture to remind myself that, once, the toy box I built for him did indeed have all its pieces and hardware, including a childproof lid and safety hinge locks on the inside. Ah, yes, it is a thing of beauty for at least a week, maybe two. I’m figuring the tyke will completely destroy it in three to five years, but I could be mistaken. Young boys in our family don’t treat their furniture gently. I did try and prepare by building it like a tank, but I’m sure when confronted with the school of hard knocks it’ll suffer defeat. Christmas is coming early and often for me this this year — trying to get families together at the same time has resulted in at least four different Christmas gatherings. At the first of these many gatherings I scored a Craftsman folding utility knife with rosewood handle. 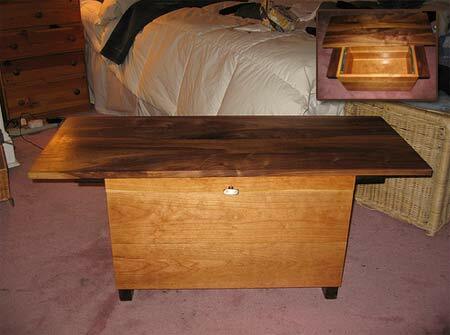 We’re sure Mike Haney got uber boyfriend points for designing and building this sliding-top bench/chest for his girlfriend for Christmas. She was eyeing a cheap Swedish version at the local Ikea, so Mike stepped in to provide a quality version instead. Check out the awesome dark wood/light wood combo — pure sweetness. We must say it turned out great, and we think anyone would be proud to have it grace their bedroom. Did you get any cool, tool-related loot this year? Post it up to the photo pool — we’d love to see it! 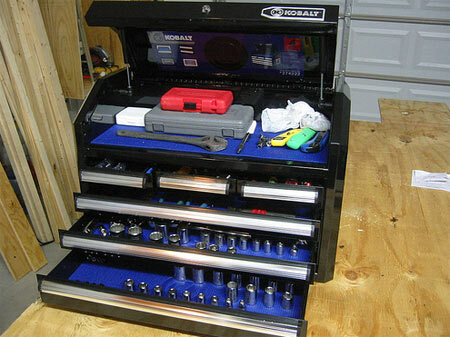 A shiny toolbox with neatly arranged drawers and no clutter — this has to be x-mas loot if ever we’ve seen it. Toolmonger reader and Flickr pool member hopsean posted a slew of pics of his holiday haul. One of our favorites shows a total close-up of how the drawer pull is constructed, for any interested parties. We also love that the Kobalt boxes come with covers. Not that you’re ever going to use ’em, but they do come with covers. 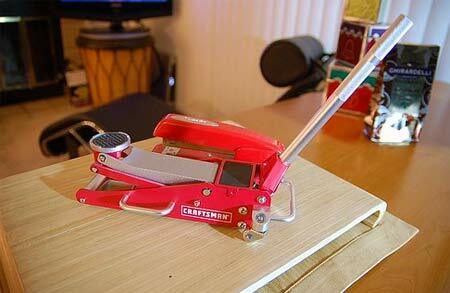 Toolmonger photo pool member greenturtles002 posted this great pic of his X-mas loot — a sweet Craftsman mini-jack, with a red stapler behind it to show the scale. Now all he needs is a working Nascar model to lift with it. Sure, the desk would be a little crowded at that point, but anything worth doing is worth doing big! I love building wooden storage projects, for two reasons: first is the simple joy of making something, and second is the added organization to my home and shop. I’m addicted to it. I must build tables, shelves, cases, and cabinets. 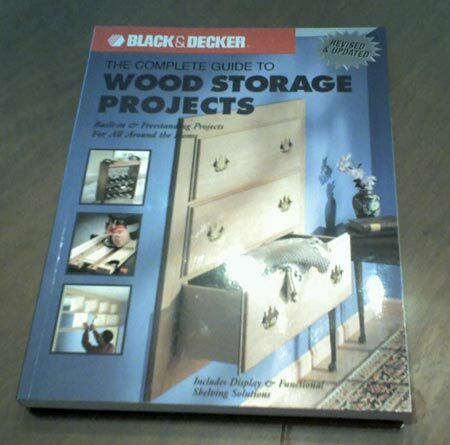 Luckily, Santa saw fit to stuff my stocking with this sweet book from Black and Decker. I haven’t had time to read it yet, but just looking at the pictures I can tell it was written in the ‘80s. Lucky for me wood projects haven’t changed that much, and a lot of them are still pretty cool with a twist here and a mod there. This year, Amazon Santa dropped a Gardner Bender SE-94 automatic wire stripper in my stocking. The SE-94’s jaws automatically adjust to strip 10 to 26 gauge wire. 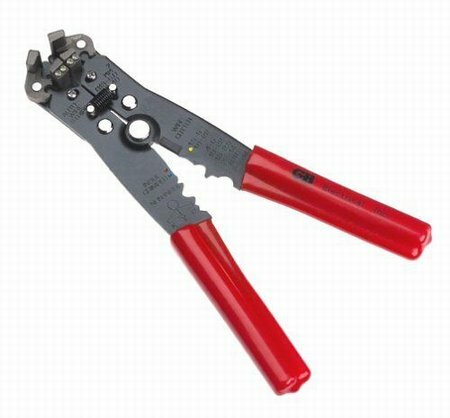 One set of jaws grips and cuts the wire while the other set pulls back the insulation — all with one squeeze. I’ve enjoyed it so much, I spent the last 36 hours looking for wire to strip. Garnder Bender also included an integrated blade-and-anvil type wirecutter as well as a set of crimpers. 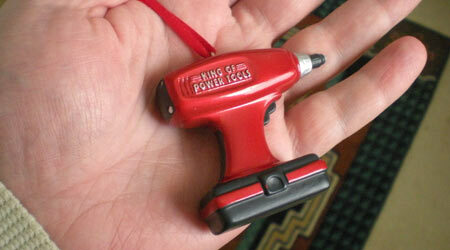 If you want a really nice, super useful tool, cash in those gift cards and get yourself one of these for about $14. 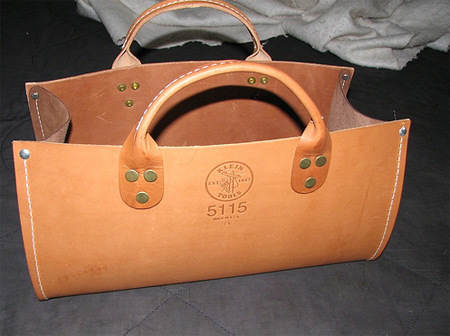 Reader and Toolmonger photo pool member poinographer posted this picture of his sweet new Klein leather tool bag. I’m jealous. I didn’t even know Klein made bags like this: simple, sturdy, handy, and easy to get at. Congrats on the cool bag, sir, and we hope it’ll see many a One-Beer Project in years to come!